UML state machines are quite popular and useful to specify dynamic components of software systems. They have a formal static semantics but their execution semantics is described only informally. Graph transformation, on the other hand, constitutes a well-studied area with many theoretical results and practical application domains. In this paper, an operational semantics for a subset of UML state machines is proposed which is based on graph transformation. In more detail, a UML state machine is described as a structured graph transformation system in such a way that the wellformedness rules of UML state machines are satisfied and the firing of a (maximum) set of enabled non-conflicting transitions corresponds to the application of a graph transformation rule. The presented approach uses the concept of transformation units, a recently developed modularization concept for graph transformation systems. This work has been supported by the Deutsche Forschungsgemeinschaft, the ESPRIT Working Group Applications of Graph Transformation (APPLIGRAPH) and the EC TMR Network GETGRATS (General Theory of Graph Transformation Systems). OMG. UML 1.3 documentation, 1999. 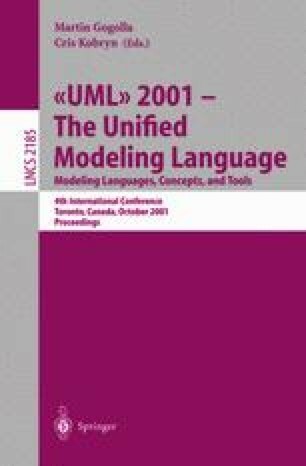 Available at http://www.rational.com/uml/resources/documentation.